Journal Arbitrer is focused on publishing the original research articles, review articles from contributors, and the current issues related to language and linguistics. 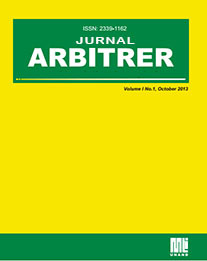 The main objective of Arbitrer is to provide a platform for the international scholars, academicians, and researchers to share the contemporary thoughts in the fields of language, language teaching, and linguistics.It also aims to promote interdisciplinary studies in language, language teaching and linguistics and thus become the leading international journal in language, language teaching and linguistics in the world. The journal publishes research papers in the all the fields of language, language teaching, and linguistics such as, Phonetics and Phonology, Morphology, Lexicology, Syntax and Language Typology, Semantic, Pragmatics, Discourse Analysis, Grammar Analysis, Historical Linguistics, Dialectology and Language Evolution, Applied Linguistics, Biolinguistics, Clinical Linguistics, Neurolinguistics, Computational Linguistics, Psycholinguistics, Sociolinguistics, Forensic Linguistics, Language Teaching, Language Development, Translation, and other related studies of language.